Strasbourg (map) is the capital and the largest city of Alsace, a region in northeastern France bordering Germany. This historic city is home to a renowned university and is also the seat of the European Parliament. In 1988, its historic centre, also called Grand Île (or Grand Isle as it’s situated on a big island in the Ill River), was listed as a UNESCO World Heritage site. The Grand Île is a maze of atmospheric medieval streets and stately squares lined by gorgeous buildings. At one end, the impressive Cathedral (a stunning Gothic structure completed in the 15th century, with its characteristic single tower) commands the attention, whilst at the other end, lovely houses perched over the Ill River in the Petit France neighbourhood are the perfect definition of ‘picturesque’. Scroll down for a photo essay of my impressions of Strasbourg as I strolled around the Grand Île. I started my stroll in the gorgeous Petit France neighbourhood. Reflections of the houses in Petit France in the Ill River. The Petit France neighbourhood, with its medieval Rhineland architecture, is absolutely charming. On the left, you’ll find the old tannery. More beautiful houses on the banks of the Ill River. The Petit France neighbourhood and the adjacent tanner’s district are packed with lots of restaurants, cafés and wine bars. I stopped at this pattiserie for a pretzel snack. And at a café for a Fischer beer, a beer that has its origins in Strasbourg. Loved this beer! A panoramic view of the houses on the Ill River. From Petit France, I continued to Place Gutenberg, with its German Renaissance architecture and colourful carousel. 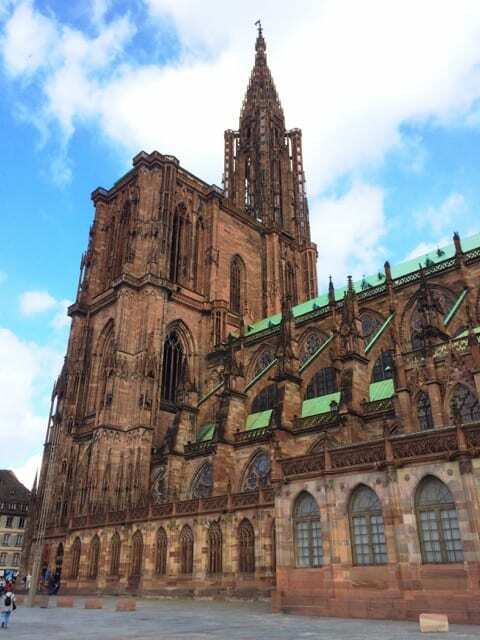 From Place Gutenburg, I slowly made my way along some busy shopping streets to the impressive Cathedral. 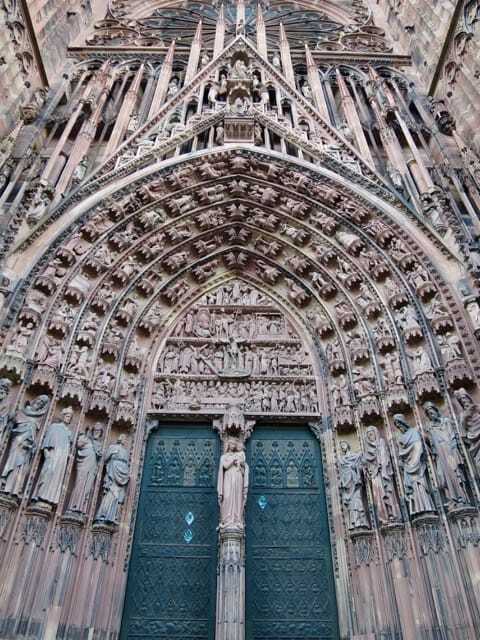 A close-up of the elaborate entrance to the Strasbourg Cathedral. Work on the Cathedral started in the 12th century and was eventually ‘finished’ in the 15th century. Apparently, they ran out of funds before work on the second tower could commence. You can easily spend several days exploring Strasbourg to admire its eclectic architecture, learn more about its colourful history at its museums and palaces, and soak up the wonderful medieval atmosphere. I only spent an afternoon here and wished I could have stayed longer, if only to see the city without the hordes of day-trippers (of whom I was one!). 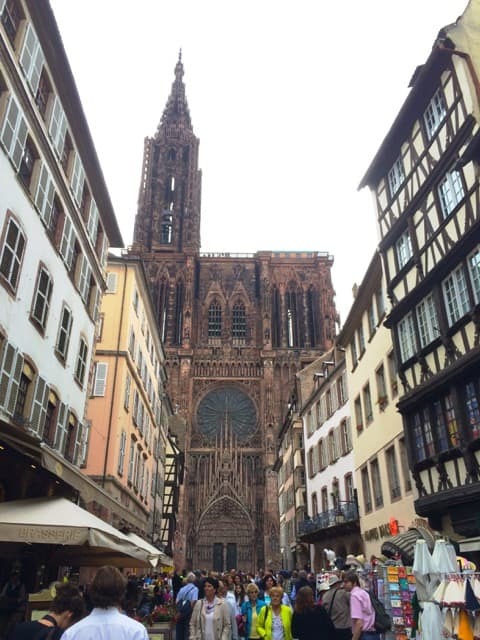 If you’re travelling around France, I definitely recommend adding Strasbourg and the broader Alsace region to your itinerary. Search for hotels in Strasbourg (Booking.com). 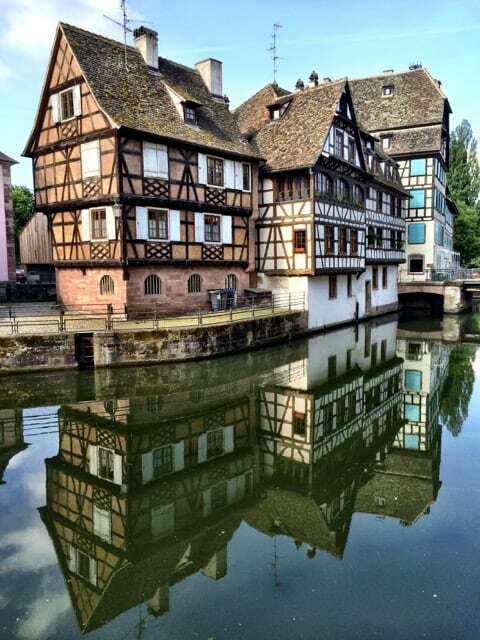 Note: Strasbourg was one of the stops during my Rhine river cruise with Viking Cruises. Hi! Your pictures are amazing. Been in Strasbourg twice and found out that it is one of the most beautiful cities in France. 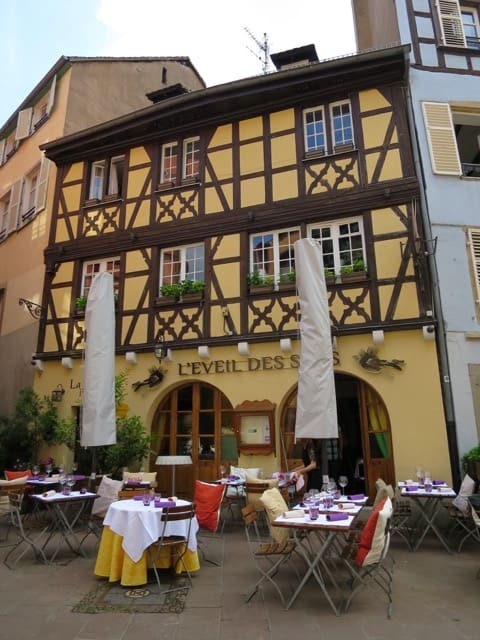 Also the region Alsace has beautiful towns to visit on a day trip from Strasbourg. I have written a post in my blog about the trip I made there a few years ago. I would recommend all visitors nearby not to miss the enchanting landscapes if the region. Thanks for your lovely comment. Gosh, that makes it two reasons to go back: the astronomical clock AND the Christmas markets! I spent three days there recently on a stop over between Paris and Munich (via train). What a beautiful town! Your photos capture the essence of it wonderfully. If you weren’t able to make it to the noontime running of the astronomical clock inside the cathedral or the Alsatian Museum, you should definitely try to go back. That’s a great reason to visit Strasbourg! I would love to see the Christmas markets there! I’m sure it’s an enchanting experience. Thanks for the tip about taking the train from Paris – I didn’t know you could get there so quickly from Paris. Spent two days in 2013 visiting the Christmas markets. Only about a two hour train ride from Paris and well worth the effort. Beautiful city. Thanks for reviving the memory. so many beautiful colors, love these colorful houses! We were there for a night earlier this month – a first visit – gorgeous and totally agree with everything you say. Made a last minute (much cheaper this way) booking at Hotel Ronan by the cathedral. Totally recommend that too. Yay, thanks Stephen! 🙂 Didn’t get to spend much time there but sure loved it! Very nice! Love the photos. You’ve done this city justice.